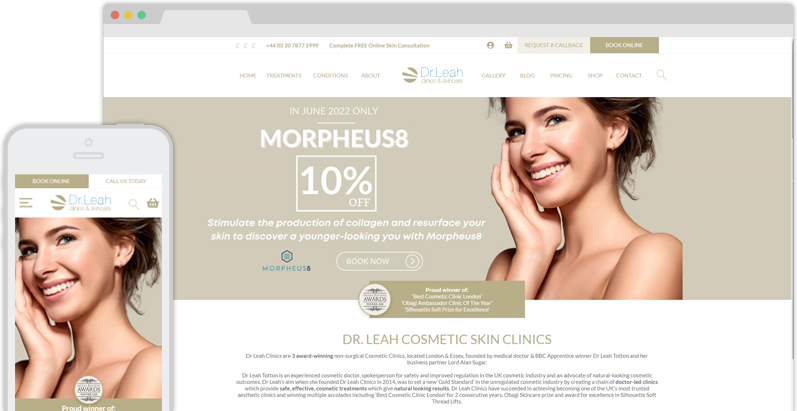 Dr Leah Totton, winner of The Apprentice 2013, asked us to create a stylish, user-friendly website for her cosmetic skin clinics. We worked closely with Leah to deliver a truly outstanding responsive site, complete with an online booking form and a clean, contemporary design. Both Dr Totton and her business partner, Lord Sugar, were very pleased with our work, and the cutting-edge website that we developed has helped the Dr Leah brand to become a leading light in the aesthetic medicine industry. 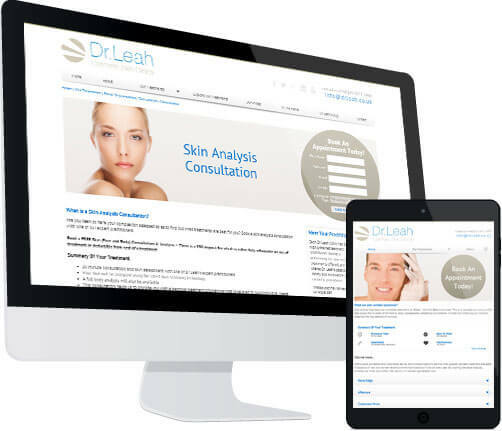 We created www.drleah.co.uk, a fully responsive website with exceptional usability. clean and contemporary, and every element of the site is fine-tuned to provide the best possible user experience. "Designer Websites came highly recommended to me by former Apprentice winner Ricky Martin, who worked with them on the HRS website. I was impressed by them as a company – they were fantastic throughout the whole process, and they have created a fantastic website. A pleasure to work with, and a company I am happy to recommend to any business seeking a web designer." 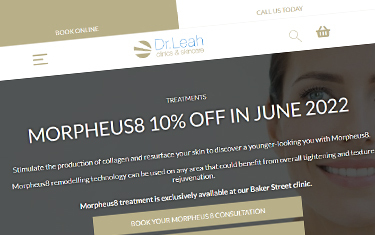 Responsive Websites: Dr Leah ClinicsAfter winning the ninth series of The Apprentice, Dr Leah Totton founded Dr Leah Clinics & Skin Care in partnership with Lord Alan Sugar. Leah is the second apprentice we have worked with – back in 2012, we developed the website for Hyper Recruitment Solutions, the company owned by series eight winner Ricky Martin, and it was Ricky who recommended our services to Dr Totton. It was clear from the start that the Dr Leah site would receive a lot of attention when it went live, and so we were determined to create a functional and modern website that would do Leah, Lord Sugar, and Designer Websites proud. This would require an intuitive user interface, clear and simple navigation, and (perhaps most importantly) a cutting-edge responsive design. Responsive Website DesignResponsive design – which ensures that websites look good and function properly on any device, including mobile phones and tablets – is quickly becoming the standard approach to website creation. Google recommend it as a best practice, and implementing a responsive design is a good way to make sure that every user has a good experience with your website. 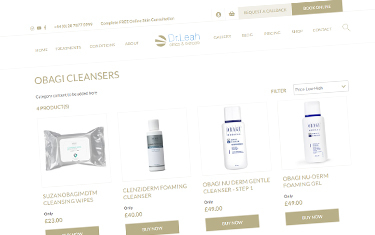 Naturally, a high-profile website like drleah.co.uk would have to be responsive if it was to fulfil its potential, and so our design team created a stylish and contemporary responsive site that would work perfectly on any platform, from iPads to Androids to desktop PCs. Interactive Treatment GuideOne of this site’s most unique features is the interactive treatment guide, which can be found on the ‘Explore Our Treatments’ page. The clickable 3D model allows users to select a body area (e.g. forehead, abdomen) and browse the treatments available for that area. This tool makes it far easier for potential clients to find the treatment they’re looking for, particularly if they’re unsure of the procedure’s exact name. 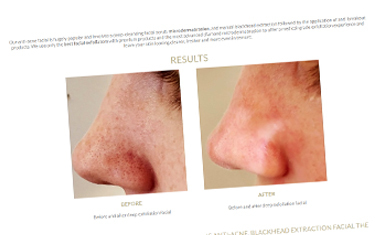 Treatment PagesDr Leah Clinics offer dozens of different cosmetic treatments, all of which needed to be concisely laid out on the company’s website. Our designers collaborated with Dr Leah’s staff to create a ‘Summary’ section for each treatment page; this gives users all of the crucial details about their chosen treatment (such as procedure time, recovery time, and potential side effects) at a glance. If a user wishes to learn more about their treatment, additional information is provided in a collapsible ‘More FAQs’ section, which makes each page as informative and as useful as possible without overcrowding the available space.